I am teaching a class in September on using packing tape for an image transfer. This is a sample I've made for the class. Are you already groaning and saying to yourself that these transfer techniques do not work? I agreed with you until I tried the hot water technique. I am amazed at the continued success I've had with it. Disclaimer: I read about this technique on the internet and did not save the link. I wish I could give credit to the person who first discovered it. If you know who that person is, please leave me a comment below. I would like to thank them and give them the credit for this easy technique. This technique works well with images copied using a copy machine and with images from magazines. It does not work with inkjet printers. I tried it this morning with Archival Ink and it didn't work with it either. It is a very simple technique requiring the following tools. Place image face down on clear packing tape. I'm using 3M brand. I have noticed that packing tape comes in different thicknesses. The thicker tape give a more stable transfer because it doesn't tear as easy. Burnish image making sure all parts of image are clearly attached to the tape. I burnish on both sides. Trim image while still attached to the tape. Place your image in a bath of hot water. I run mine under the kitchen tap. When you see that the paper has absorbed the water gentle begin rubbing away the paper backing. Let dry to see if there is still a film of paper on your image. If so repeat rubbing very gently. The key to this is patience and rubbing gently. The butterfly is the image I transferred. The image came from a Dover Publishing CD. I'm not sure the one I used is still in publication but Dover has several other CDs you could use. 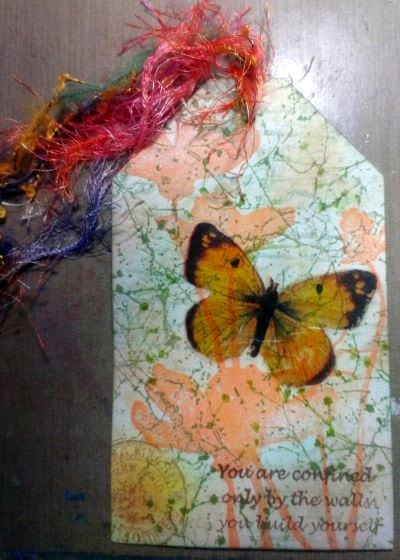 The background of this tag is stamped with a crackle background by Just For Fun Stamps. I also used a Weed Love by Rubber Dance Stamps. I love this set of stamps. The weed make the best backgrounds. The words are Something Wonderful by Rubber Dance. The orange flowers are a Donna Downey Unity Stamp. The little seal in the bottom corner came from a dollar bin I think. If you try this technique, please let me know how you like it. Hey Boo! Your tag is beautiful - would live to see yo do this technique. WOW I love this! I am going to try this technique.